That’s quite an accomplishment. A tremendous honor. My hat is off to Mr. Haggis. However, Crash is a heavy-handed, blunt-instrument of a movie that’s supposedly a bold statement about racism. Or something like that. In using a hand-held camera for much (if not all) of the film, and by peppering the movie with as much anger and swearing as possible, I can only assume that Haggis was attempting to capture stark reality, a vivisection of life in L.A. that demonstrates to one and all that racism exists in everybody (mostly white people, though). Yet, at best, this film offers an uneven verisimilitude that never reaches whatever lofty ideal Haggis had in mind. This is Hollywood’s view of racism…complete with foul-mouthed, N-word-spewing, car-jacking black guys, paranoid, uptight, upper-class white guys, racist cops, short-tempered, racist Middle-Eastern guys – you name it. Racism, racism, racism. From every pore of every human being in this movie. Blacks against whites. Whites against blacks. Blacks against Puerto Ricans. This is every stereotype ever uttered, every cliche ever read, seen, imagined, heard, watched, and dreamed of all rolled into one dark, dreary, depressing mess. And then all wrapped up nice and neat, with more warm fuzzies than a box full of puppies. This isn’t a movie. This is a PSA for race relations. The only difference is Crash is 112 minutes long rather than 60 seconds. Essentially a series of stories that intersect in some way, each with is own plot twists and cast of characters, Crash is a movie about innocence lost, respect gained, lives healed, lives lost, restoration, redemption, and hope. Some of the scenes are gripping – like the scene in which Officer John Ryan (Matt Dillon) rescues Christine Thayer (Thandie Newton) from a burning car…or the scene in which the Middle-Eastern store owner shoots a little girl held in her father’s arms – but, overall, all I saw here was 90 minutes of intensity and racial cliche followed up by 20 minutes of the aforementioned container of youthful canines. The soundtrack is interesting, though. 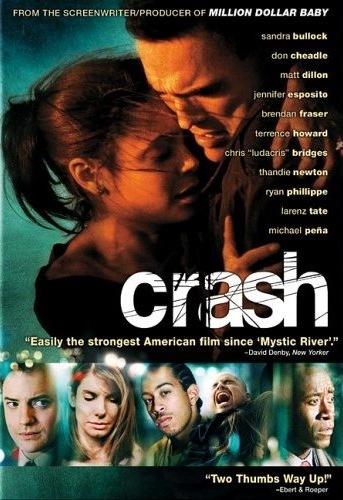 Crash was nominated for six Academy Awards and won three: Best Achievement in Editing, Best Motion Picture of the Year, and Best Writing, Original Screenplay (Paul Haggis, Robert Moresco). The only reason I can think of why Crash was Best Picture and the other Academy Awards is because it was up against Brokeback Mountain, Capote, Good Night and Good Luck, and Munich. A drearier bunch of films I can’t imagine I’ll ever see. Upon further reflection, I think it’s not necessarily Haggis’ writing that doesn’t ring true (although the glibness and wit and stream-of-consciousness exchanges – especially from the street thugs – seemed woefully forced in some spots). It’s the entire premise of the film. It’s constructed well. It’s filmed well. It’s, for the most part, acted well. It’s even written well. But it’s impossible to watch this movie and suspend disbelief long enough to think of it as anything other than a movie. Plus, when you compare this movie to previous Best-Picture Oscar winners, one thing is crystal clear: there’s no comparison. If you want to understand racism, watch In the Heat of the Night. Or even Forrest Gump. Or, best of all, Driving Miss Daisy. Those are films worthy of Best-Picture accolades. Crash is, well, a racier and more foul-mouthed TV Movie of the Week. Frankly, my head hurt so much from being beaten by the brutal club of racism I couldn’t even get to the puppies. We all know there is, unfortunately, racism out there…this sort of a movie certainly isn’t the way to heal or change any part of it. It’s not even a reminder of the way things are, or were, or could be, or shouldn’t be….it’s clearly nothing more than an angry rant trying to disguise itself as entertainment. Nothing entertaining there.